live:cut enables multicam-workflow for up to 16 cameras, dramatically reducing production time by eliminating many time-consuming production processes. live:cut is designed to make the most of today’s multi-camera productions, dramatically reducing production time by eliminating many time-consuming production processes. From talk and game shows to soaps and sitcoms up to live concerts and event recordings, live:cut is a powerful solution for any multi-camera production. live:cut works by centralizing ingest, metadata, live logging, media management and workflow automation in a single, easy to use interface. Re-edits and post-production tasks can be immediately performed, even while still recording. A single button starts and stops the recording process. Notes, labels, markers and comments can easily be set during the recording. 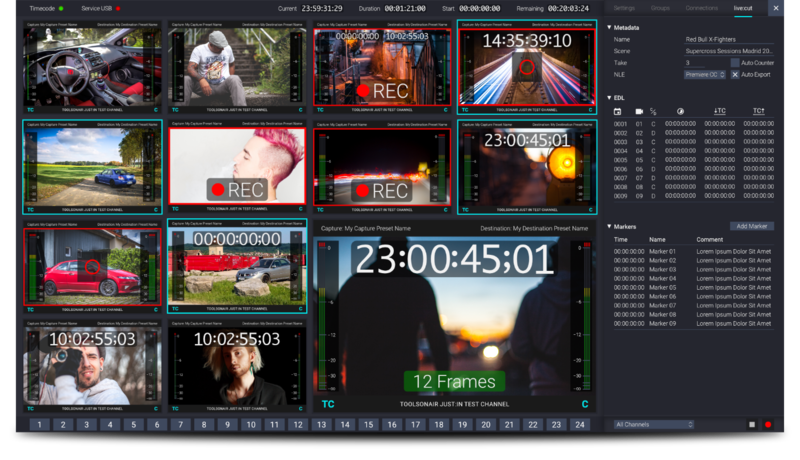 live:cut creates a realtime vision mixer’s EDL, which is instantly processed into a multi-camera timeline in your NLE of choice and ready for fast turnaround post-production. Recorded takes are tracklayed, organized and sent to workstations or your MAM of choice for further processing. live:cut works with just:in to accommodate up to sixteen channels of multi-camera ingest. Additionally it integrates seamlessly with just:live to send selected takes directly to just:live’s multi-camera track for instant replay and playout. Available in flexible hardware setups, ToolsOnAir’s live:cut is the ideal low-cost, low-space and energy efficient solution for OB-vans and other on-location multi-camera setups.